My biggest complaint about having two dogs is the amount of hair they shed. Both of our “pups” have long hair, nor do they really shed for a summer or winter coat; however, hair is just always everywhere. That’s why I was very interested in seeing how Halo Healthsome might help with this issue. Disclaimer: As part of my partnership in Chewy.com’s Blogger Outreach Network, I was provided a sample of Halo Healthsome for my dogs in exchange for a review. All opinions, however, are 100% my own (since I can’t ask the dogs). The ingredients list intrigued me–there is nothing in the list that I didn’t know what it was or how to pronounce! (Pea Flour, Potato Flour, Salmon, Tapioca Flour, Pumpkin, Salmon Oil, Tomatoes, Cranberries, Soybean Oil, Apples, Sweet Potatoes, Wheat Germ Oil, Safflower Oil, Sunflower Oil, Garlic Oil, Cod Liver Oil, Anise, Ascorbic Acid (a Source of Vitamin C).) When I read lists like this for food I consume, I get super excited for the health benefits, so to be able to pass this good stuff off to my dogs is a good feeling. If the dogs could talk, I think they’d say the liked the treats. They looked easy to chew then swallow (at least by Shadow–Rowdy tends to inhale his food, regardless of size or taste). The treats didn’t break all over the floor (even though some were broken in the bag). While they haven’t ate enough treats to show a difference in their coat and skin, I’m taking Chewy’s word for it. 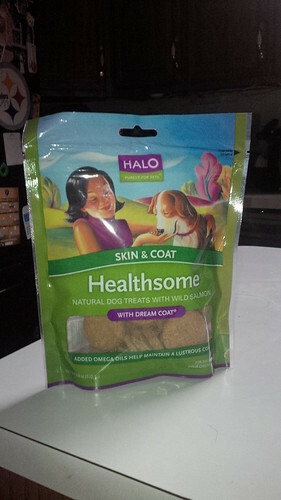 We’ll probably continue to rotate Halo Healthsome Skin & Coat in the dog’s treat options, especially when they are on sale (you can get a 6 ounce bag for $5.99 normally; however, there is a special for $3.49 right now). You can get your own through Chewy.com and have them delivered right to your house, one more reason to give these a try! This entry was posted in Product Reviews, Rowdy, Shadow and tagged dog treats. Bookmark the permalink.